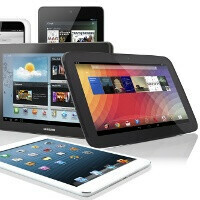 Tablet sales are not only going to top notebook sales in 2013 according to analysts’ consensus - they will also outperform their 2012 sales hugely, growing from 130 million shipments to between 170 million and 180 million shipments in 2013. And while the iPad will still dominate the larger tablet segment, Android will have a commanding share of the 7-inch tablet market despite the growing popularity of the iPad mini. For some context, in 2012 manufacturers shipped a whopping 73.4 million 9-inch and larger tablets, accounting for a year-on-year growth of 35% and a total share of 59% of the overall tablet market. And while in 2012 larger tablets prevailed, the tide will turn in 2013. Seven and eight-inch tablets are expected to become much more popular due to their huge price advantages and end the year with a 60% share of the whole market. Not all companies have announced their projections for next year, but Samsung for instance expects to double the number of shipped tablets next year. I think you're looking way too far into it.